October is a great month to celebrate a colorful fall season. Line of holidays awaits kids and adults this month. Everyone is talking about celebrations, long weekend activities and costumes they are going to wear on Halloween. 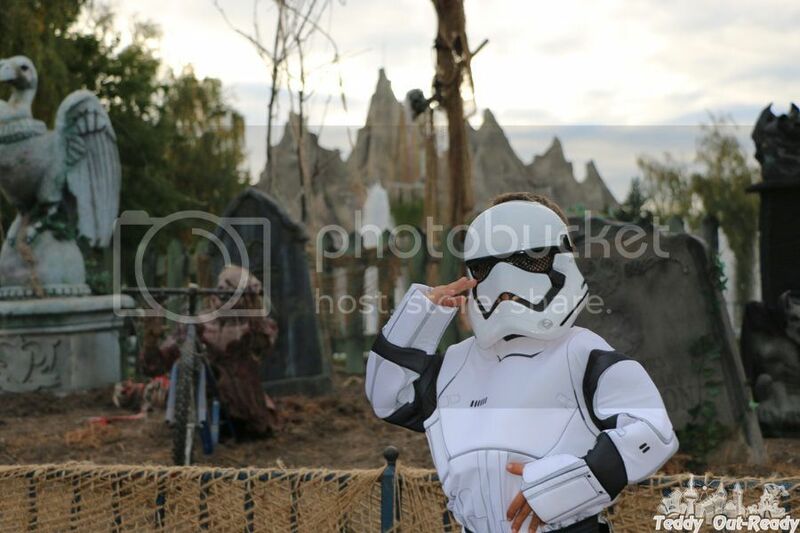 For Teddy, Halloween costume is the outfit of the month in October, because he wears it to different fall events from Canada’s Wonderland Costume Parade to his art, music and sports classes. With upcoming release of Star Wars: The Force Awakens in December, Teddy decided to become one of Darth Vader's soldiers - Stormtrooper. To serve the First Order, we decided to order one of Star Wars Costumes for Teddy. 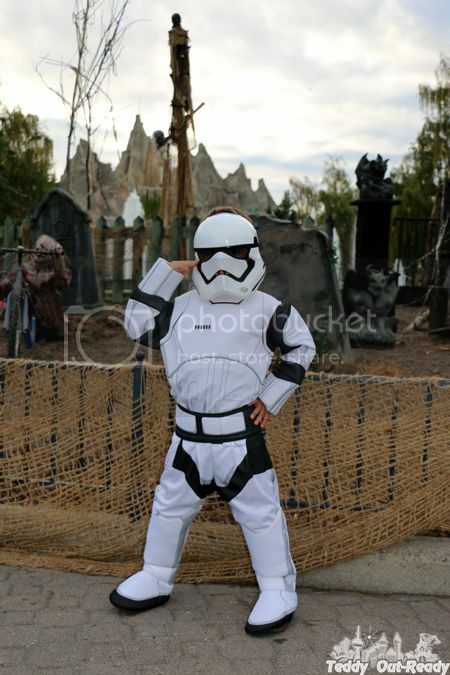 His choice fell on Child Star Wars Episode VII Deluxe Stormtrooper Costume. We ordered him the medium size costume, knowing that it will be a little bit bigger for our little soldier, but kids grow fast and at the end of October this costume is going to fit him perfectly. If you are still looking for a costume, check Costume Discounters on Twitter, they often post about sales and their costumes are very affordable. The Deluxe Stormtrooper Costume is designed as a white jumpsuit with extra details to reflect famous Stormtrooper armour. The top of the suit has foam filling to show some muscles and make it look like a real warrior - strong and confident. The costume also comes with a belt to make the outfit look authentic. It can be detached if needed. Teddy said that the belt is useful to hold Stormtrooper’s blaster. Another very interesting feature of the costume is attached boots which are not real boots but rather covers and look absolutely amazing. The boots have elastic straps with Velcro at the bottom to keep boots in place and make sure that they properly attached to the shoes. I like how the Deluxe Stormtrooper mask is designed for children in this costume. It is made from plastic and does not have that Dollarstore smell. It is important because children put masks on their faces and spend hours wearing them, playing and having fun. Luckily this Stormtrooper mask is a pretty good one. It has a fabric net cover over the eye holes and clear little holes over nose and mouth openings. Authentic breathing filter is added to the mask as an extra detail. The Stormtrooper mask has Velcro straps to easily fit any child’s head, and simply take it off in case your kid does not like to wear it. There is no Star Wars without Stormtroopers in the Forces. 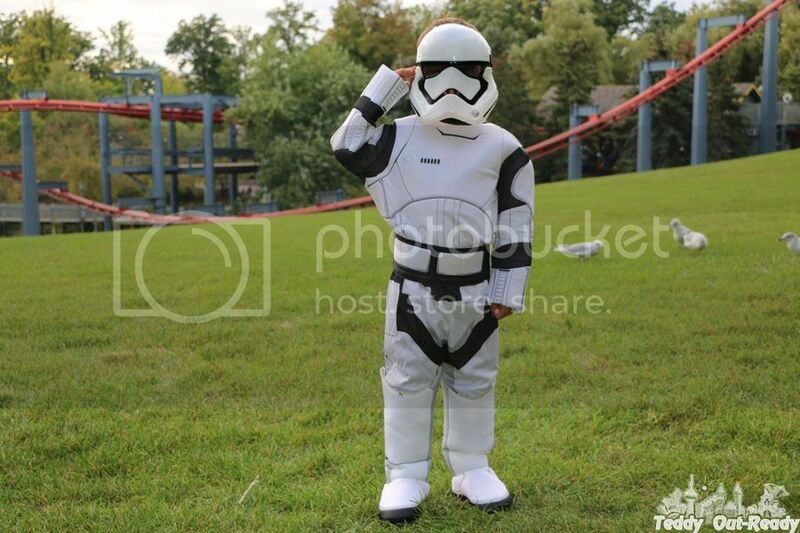 There is not much time left till Halloween, so if you like to join the Forces and become a real menace to the Galaxy, check the wide selection of Star Wars Costumes at Costume Discounters and become a part of the huge Galactic Empire. *Special thanks to Walt Disney Studios Canada for providing the image from upcoming Star Wars: The Force Awakens movie used in this post. Love this costume! Star Wars is a pretty solid theme to go with! Great costume! I love Halloween. Our neighbors are going to be a star wars family. My boys are huge Star War fans. They would love this costume. He is so adorable in that costume. I really like it. Oh my gosh, he looks awesome in his costume! That's so cool! You have a little Stromtrooper! 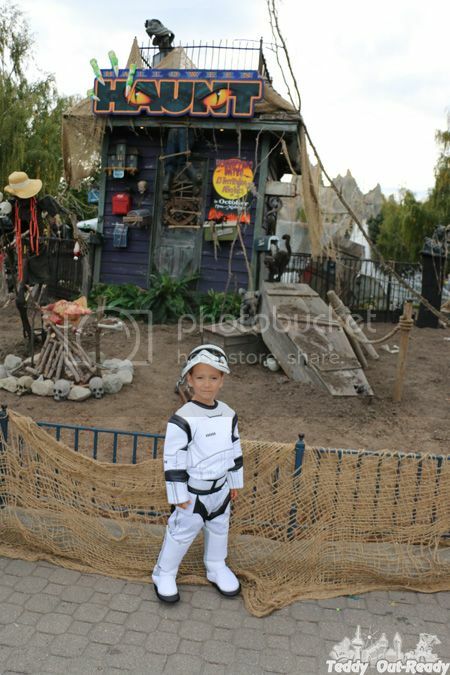 I really like Star Wars costumes for kids, everything looks adorable! Love this costume. So fun! We love Star Wars! He looks cute with the costume. My two boys was a huge fan of Star wars. That is a very well done costume with so many details! I think Star Wars is going to be a popular theme this Halloween. OMG he is very adorable. Star Wars is very popular right now. What a cute costume. My son will love this. What a cute costume! My kids are huge Starwars Fans.